About this Spot: Bella Thorne was spotted wearing this Keepsake It's Not Over Playsuit while heading to WPIX Studios in NYC on August 2nd, 2012. 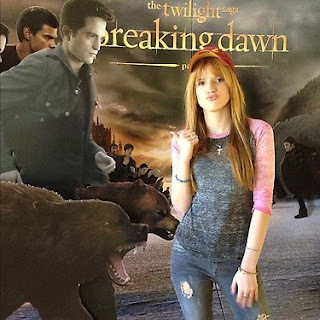 About this Spot: Bella Thorne wore Wildfox Vampire Lips Destroyed Sweater while out with her boyfriend. About this Spot: Bella Thorne wore Keepsake Perfect Stranger Dress to the 'wreck' premiere. This flirty and playful dress is perfect for a night out. Sweetheart neckline with full skirt and completely open back. Hidden zip closure on side. Measures approximately 26" from shoulder to hem. 100% Polyester. Lining is 100% Polyester. Imported. About this Spot: Bella Thorne was spotted wearing this BDG Baseball Tee while sharing her excitement for the "Breaking Dawn: Part 2" movie in a Twitter Picture. About this Spot: Bella Thorne was spotted wearing the "Big Girls" Version of this Ooh! La, La! Wow Dream back in February at the Tutus 4 Tots Event. (Little Girls & Big Girls) A voluminous princess skirt adds an enchanting glow to a twirl-ready dress embellished with sparkling sequins at the bodice. Cotton/polyester; hand wash. By Ooh! La, La! Couture; imported. About this Spot: Actress Bella Thorne arrives at the Premiere of Paramount Pictures' "Fun Size" at Paramount Theater on the Paramount Studios lot on October 25, 2012 in Hollywood, California. This evening dress by Hunt No More has been crafted from lightweight chiffon fabric. 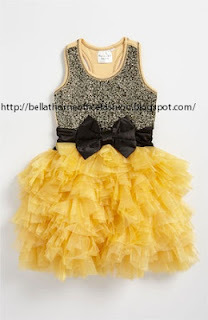 The details include: a backless design with low v-neckline, sleeveless styling, a cinched waist with metallic sequin embellishment, a printed skater-style skirt, and pockets to the hips. The dress has been cut with a fit and.. Strikingly slim straps perfect the polished poise of a paneled pump set on a slim heel. Adjustable straps with buckle closures. Approx. heel height: 5". Leather upper, lining and sole.